Phelps County Bank is located in the historic Edwin Long Hotel. The building opening just 3 days before 8,000 people flooded into downtown Rolla to celebrate the grand opening of Route 66. A car could now travel from St. Louis, MO to Tulsa, OK on one road. Upon the highway’s completion, Route 66 stretched 2448 miles from Chicago, IL to Santa Monica, CA. 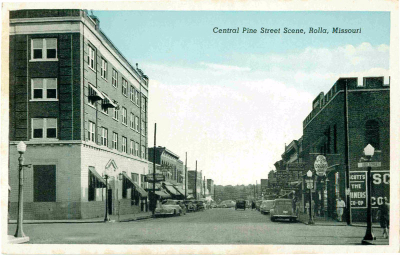 When the 8,000 gathered outside the Rolla hotel in 1931, Missouri was the first state to have the entire length of Route 66 completed across its state boundaries. The viewing stand was erected at the corner of 8th and Pine Streets. 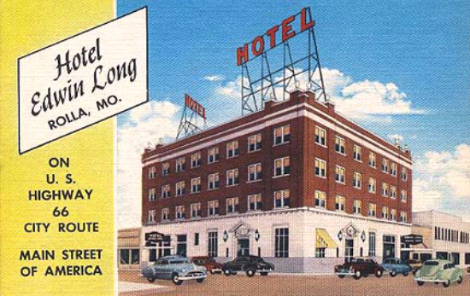 The Edwin Long Hotel was the headquarters of the celebration commemorating the opening of Route 66 across Missouri. A number of dignitaries from around the state were in attendance including Missouri Governor Henry Caulfield. Parades were held down Pine Street and speeches made to commemorate the new highway. 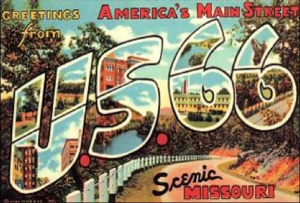 US 66 was known as the Main Street of America because it utilized many “main streets” in the cities and towns along its route. By utilizing existing roadways, states were able to reduce constructing costs. It was also known as the Mother Road. As the primary mode of transposition across western America during the 1930’s and 1940’s, Route 66 was seen by many Americans as a path to new opportunities. The Edwin Long Hotel in Rolla is now the headquarters for Phelps County Bank and is on the National Register of Historic Places in Missouri. Phelps County Bank has a 2nd banking center along Historic Route 66 at 220 North Jefferson in St. James and a 3rd location on Route 66 inside the Havener Center on the Missouri S&T campus.